Dr. Bill Tormey, Dublin North West Fine Gael; Glasnevin; Finglas; Ballymun; Councillor; DCC » Health Comedy Sketches. Minister for Health James Reilly has said the health services cannot be viewed as a business and PAC Chairman John McGuinness is wrong to attack the leadership who are maintaining services in difficult circumstances and have his confidence. Mr Reilly said he agreed with the PAC chairman that the Health Service Executive structure is not fit for purpose. He said the HSE would be replaced with a service that will work more effectively and improve outcomes for patients. Minister Reilly said the Department of Health was also being reformed. HSE Director General Tony O’Brien described a call for his resignation by Mr McGuinness as “political comments” and said he was sure Mr McGuinness had political reasons for making them. Speaking to RTÉ News Mr O’Brien said his job is to run the health services in very difficult circumstances with continually diminishing resources and for that reason he was not going to enter into the rough and tumble of political commentary. Mr O’Brien said he would focus on the interests of health service users and of staff and on continuing the continuous improvements of the health service. Mr McGuinness this afternoon asked Mr O’Brien and Department of Health Secretary General Ambrose McLoughlin to resign. Mr McGuinness said that hospitals are not being managed within their service level agreements and within budget. He said: “It’s a business so on all of the major fronts you failed. “And as a representative of the shareholders here, and I am sure if they were all here, they would probably look at you Mr McLoughlin as it’s you who negotiates the budget in house before it gets political on the other side, and Mr O’Brien that both of you should resign because it seems to me that this is sort of Groundhog Day. Mr McLoughlin said that the recent expenditure reductions per capita in the Irish health service are the highest of any country in the OECD, with the exception of Greece. He asked the committee to understand that as a civil servant he is obliged to carry out the decisions of the government and the minister in these matters, as is Mr O’Brien. Mr McLoughlin added that he accepts “we are in an extremely challenging environment and we will do everything we can to take on board the constructive recommendations that you have made”. He said that Ireland’s public health expenditure has lost €3bn since 2008, and 12,000 people. He said they have been trying to do more services with less, but now they are have to do “less with less”. He said that as a civil servant, he cannot enter the political realm but that he has done his best to discharge his duties as best he can in difficult circumstances over the past few years. 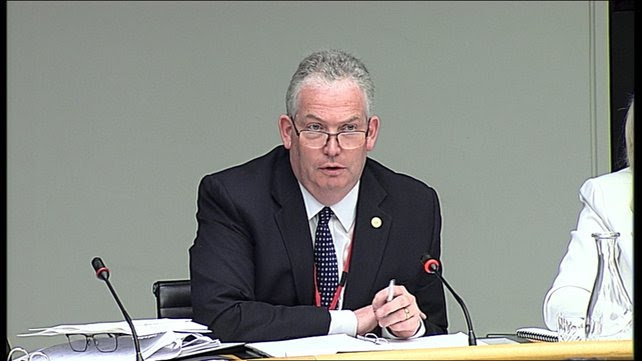 The Comptroller and Auditor General, Seamus McCarthy, has told the PAC that in each of the past five years, the HSE has sought a supplementary estimate as a result of emerging budget overruns. He said this raises concerns about the effectiveness of its budget planning and budget management. The C&AG said that there was a material level of ineligibility of card holding in the medical card scheme. He said that the financial implication of that ineligibility has not been reliably established. The Comptroller has recommended that the HSE initiate a cyclical programme of reviews of eligibility in respect of random cardholders, to establish the scale of excess payments. Earlier, Mr O’Brien told the PAC that there were 143 individuals at Section 38 agencies who were getting top-ups. He said that some of these staff have decided to leave the health service and some have taken reduced pay. He said that others are asserting a contractual entitlement to the pay and these cases have to be worked through. Mr O’Brien said the fact that they were in receipt of an unauthorised payment was not of their own doing. He said the responsibility lay with the agency making the payment. The HSE has asked employers to prove there is a contractual entitlement to being paid above the Government pay guidelines. Mr O’Brien said he hoped to provide a full report on the issue to the PAC in early July. Mr O’ Brien told the PAC that around eight people were asserting their contractual right to top-up pay. In addition, more information is being sought from around 50 individuals. He said that if some individuals are proven to have a contractual right, the HSE will have to discuss the issue with a number of Government departments. Mr McGuinness asked the HSE to investigate the payment of over €258,700 a year in an agency fee, for the temporary filling of the post of deputy CEO/ Chief Operating Officer, at the University of Limerick Hospitals. The payment was made between March 2013 and April 2014. Mr O’Brien said the post had been advertised twice under the public appointments process and could not be filled. He said the agency appointment was not permanent and the person was not an employee and he would also need to see if the payment related to more than one person. Mr O’Brien said he would look into the issue but said he would not “investigate” it as this would suggest something else. Elsewhere, the Dáil Committee on Procedure and Privileges has asked the PAC to provide more details about its application for compellability in relation to inquiries into Rehab and related matters before this might be granted. The letter from the procedure committee asks the PAC to name the individuals it wants to compel. It also notes that Rehab is not audited by the Comptroller and Auditor General. At the PAC hearing today, Independent TD Shane Ross described the procedure committee’s letter as a refusal by any other name and claimed it was an attempt to nobble the PAC. He suggested that the PAC get its own legal advice on its entitlement to compellability. Other PAC members suggested the PAC seek to change its remit. Mr McGuinness said the procedure committee met at 6pm yesterday evening and issued a two-page letter at 6.25pm looking for further information on two issues. The first issue relates to the administration of the controversial SIPTU fund that is being looked into by the PAC. The second issue relates to the Rehab organisation. Mr McGuinness said that some Government departments could not give all the necessary information to the PAC relating to Rehab as “there were not in compellability mode”. He said that it is up to the PAC to press for clarification by responding to the committee after seeking senior legal advice. All of the members agreed that is the way the committee should proceed.